Hawick Lau (劉愷威), who has based his career in Mainland China, recently returned to Hong Kong to visit family and friends. A while ago, Hawick was seen going apartment shopping with his father, TVB actor Lau Dan (劉丹). Also with them was Hawick’s three-year-old daughter “Little Sticky Rice”, but Hawick’s wife, Chinese actress Yang Mi (楊冪), was not in sight. The couple are rumored to be on the brink of divorce; Hawick’s “scriptgate” cheating scandal with Angel Wang (王鷗) only further complicated the speculations. 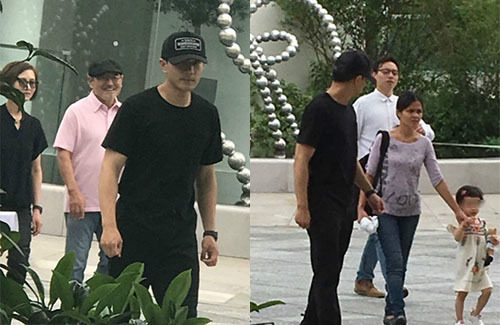 Last Sunday, a casually-dressed Hawick was spotted with his father and daughter at Sai Kung’s Clear Water Bay, where they were looking at the new apartment complexes near the Hong Kong University of Science and Technology. Hawick and his father were speaking with three other estate agents, and looked through many properties at the complex. Hawick and Lau Dan left half an hour later, seeming to have found a place they liked. According to a source, the property that Hawick and Lau Dan were looking at was a spacious 1,700 sq. ft. apartment with a 1,000 sq. ft. garden. The property reportedly costs HK$40 million. Hawick reportedly purchased two properties there—one for himself, and another three-bedroom apartment worth HK$18 million for his father.